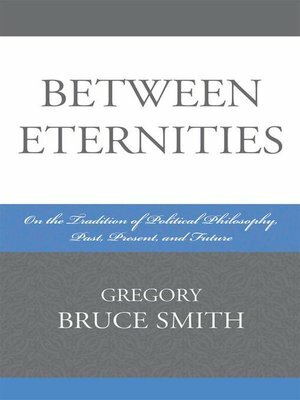 Between Eternities reflects on the possibility of political philosophy as an ongoing, architectonic activity that is necessarily linked to both the past and future. Almost all contemporary work in political philosophy either studies the subject with an eye to past tradition—choosing a winner from that tradition and then deducing what follows from the posited premises in a thoroughly modern, constructivist fashion—or else limits itself to drawing out what follows from already accepted premises and principles. There is almost no effort to reflect upon the prerequisites for the tradition being an ongoing undertaking that can have a unique future. Between Eternities attempts to set loose that thinking toward the future. Gregory B. Smith is professor of political science and philosophy affiliated with the Departments of Political Science and Philosophy at Trinity College in Hartford, Conn.